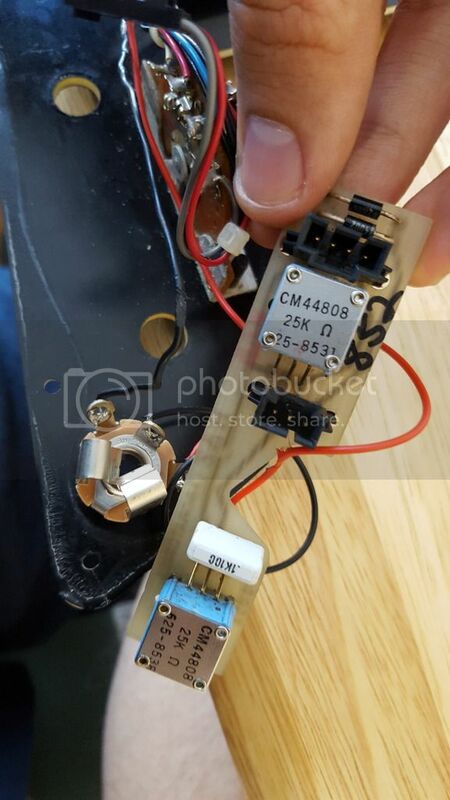 I'm having a hard time rewiring a GP4T Steinberger.I'm no electrician expert but I know how to follow a diagram but so far what I've tried doesn't work. Here are two photos, hopefully someone can give me some advice.I don't want to spend over £50 for something that I think I can do on my own. Also you may have the jack wired wrong. Looks like you have a ground wired to both leads on the jack. Put all your black leads to one terminal on the jack. There is only one plug/connector which I've always pluged when testing. The left black wire is from the battery.What do you mean to one terminal. Check to see if your cable is actually contacting the jack properly. Typically when you get no sound it is an issue in the jack. The jack is just a hot and a ground. Make sure you don't have a ground going to both. Also don't get fixated on the guitar end. Could your cable not be contacting properly at the amp. Check your basic connections. Test another guitar too. Does it play? Keep your thinking simple. I think you have a simple problem. You have a red wire in one pick that looks to have damaged insulation. Is that wire broken in two? The output jack is brand new and the cable jack is in perfect connection with it.Battery new, cable is good. When I bought it, the jack was a mess and there wasn't no battery conector so I had to buy both and then make all the wiring. Yes, the battery connector wire is extended, so I had to solder two wires together. I have no clue for what purpose is the other connector for...maybe thats the issue? Tape the damaged insulation. If it touches anything that is a short. Try a regular jack if you are suspicious. Borrow one out another guitar. They only cost $2. Ive never seen the style you are using. Where is the old one? Remember to suspect the jack 1st. Have you surfed youtubes for your model guitar? A picture of your guitar properly wired is what you need. I really don't like that jack youre using. Try a regular jack if you are suspicious. Borrow one out another guitar. They only cost $3. Ive never seen the style you are using. Where is the old one? Remember to suspect the jack 1st. Thank you so much dude! I think is just a simple thing.I'll investigate some more. Looks like you are using a stereo jack....unless you are using a stereo cable with a tip like your ipod head phones (two hots on the tip) it ain't going to work, especially as it looks like you have two grounds wired in (black wires) one will be a ground you need and the other is going to ground out the hot (red wire). Just grab a mono jack and ensure you have the hot going to the tip connection and the ground on the other and you should be good to go. Oh and yes tape up the hot wire, if the bare spot touches anything when assembled it will ground out too and you'll get no sound. I guess you could also test this by removing the black wire that's not wired to the ring/collar (top one in the pics) and taping it off and bending that prong away from the tip and you should get sound. No. The stereo jack has nothing to do with actually being "stereo". This is the standard wiring to switch a battery on active guitars, which this guitar is. Battery minus is connected to the ring connector, and if a standard mono plug is inserted, battery minus will be connected to ground and thus the guitar powered on. Next thing: don't solder on that HazLabs board if it isn't really necessary, these boards are really expensive, and the solder pads easily come off the board if they're getting too hot. There are two plugs for any input/output connection, they should be used. I've been making these connectors for my own Steinberger projects, so I could get you the missing one, too. Thanks for the info, learned something new....that's why I love this forum. Thanks a lot guys for your help and infos. So all I need is to solder the connector to the batery and output Jack,then connecting and thats it? I'd like to buy one and also a sprping tension adjustment.I will send an email.. 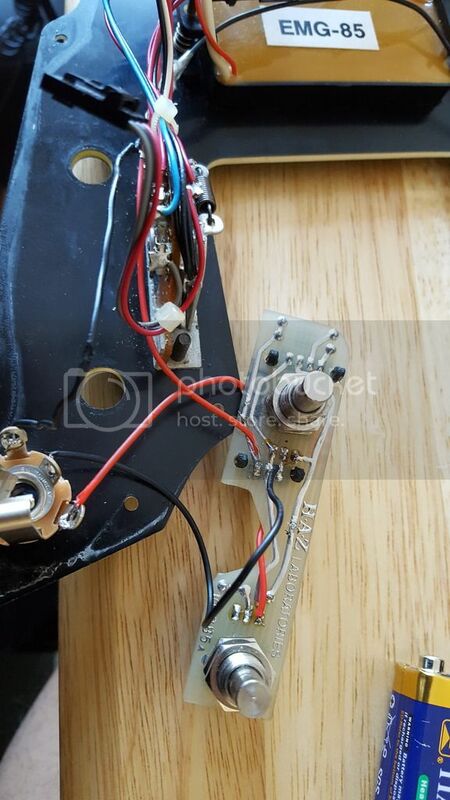 I've fixed the guitar by adding the missing connector. Thanks a lot to Bernd for providing me with my missing components and giving me the right diagram to fix it. Also thanks to everyone for trying to help.Really appreciate it!